In the summer of 2013, PIARA completed its first community library in the village of Hualcayán (District of Santa Cruz). 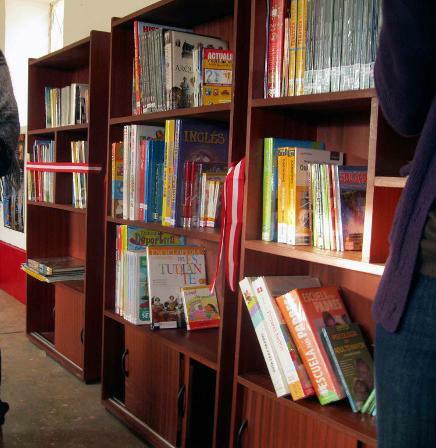 The Hualcayán Community Library has many resources for both for children and adults. The library features not only books, but computers, a projector, and a wide range of media for group activities and workshops. We purchased various books ranging from world and Peruvian literature to science, history, self-help, industry and production, and language-learning, as well as encyclopedias and dictionaries for all ages. We designed the library as a place where community members come to learn, strengthen their families, and become inspired. Having a local library, even a modest one, can drastically expand the education experience of rural children and inspire students to continue reading and learning after their education ends at age sixteen, or in the case of Hualcayán where no secondary school exists, at age twelve. See pictures of the inauguration during the 2013 Hualcayán Cultural Festival here.